I am Kevin de Smet. I have been forwarded your question by Graham and thought I’d give you a few pointers. I am familiar with CATIA from my current job doing electrical harnessing and I have dabbled in CATIA Icem kind of just reading the manual and such. I’m not sure about NX but I would reckon it’s about the same thing. Except they don’t have the brand recognition of Icem but instead run on what used to be ImageWare back in the day, now long gone and forgotten. Vanilla ICEM Surf is a little different to Alias primarily because it’s less intelligent, less parametric if you will. But the fundamentals of direct modeling as also done in Alias should transfer over quite readily. You are correct not to mention for example SolidWorks or Inventor or even Creo (former Pro/ENGINEER) because those software approach surface modeling in a different way. Even standard CATIA like Generative Shape Design is much different to CATIA Icem / Alias / Icem Surf. I’m sure NX has both also, standard surfacing functions and then NX Shape Studio for the more kind of Class A direct modeling push-and-pull control points approach. I must add both have their value, and place. It would be wrong to say one is better for everything, and the other is crap. But for the whole Class A exterior automotive thing, direct modeling in Alias or Icem really are the best tools. Kevin de Smet (elite student at LearningAlias ). A Smart Rendering Tool. Check this out! and if I’m honest, it took me personally quite some time to understand and eventually be able to model a complex fully blended C Pillar, like the one pictured here. and the level of skills that you must acquire to reach a point where you are competent to take on this surfacing challenge in Alias. It takes several months of following a specialised Alias Automotive course to reach this level. The preparation for building srf. C involves building srfs. 1-5, which have to be absolutely 100% correct for srf. C to work. usually in the form of scan data, so the clay modellers, would have resolved the way that all these srfs. flow together. Then the Alias modeller would be required to build very accurate srfs. from the given data improving the highlight to the designer’s satisfaction. If you have to build a complex C pillar from say blueprints, then it becomes a far more difficult task, as there just isn’t enough information on BP’s. to enable you to know the critical xsecs for the srfs. numbered from 1-5. Therefore building it would be a very slow process involving lots of trial and error. If you are lucky enough to have the designer sitting with you it would be tough, but if you were doing it without any support or data it would be a nightmare. The preparation would be to build the shoulder #2 and then the Deck #3 and #4 (the Deck has a base srf#3. + a blend #4 to the theoretical rear screen). These srfs. must have G2 crvtr. and the highlights must be perfect, as they form the base srfs. that srf. “C” is blended to. Next: The Cant Rail is brought down below the Deck. It is built to the theoretcal Rear Screen and not to the actual rear screen shown in the pic. The Cant Rail must blend to the Deck with G2. Finally surface “C” is built from the theoretical Side Glass and the Cant Rail and then blended with the Shoulder and Deck surfaces. I hope that you have found this insightful. My advice would be definitely to take lessons with an Alias trainer, as you need a lot of help, support, advice as well as access to specimen surfaces and meshes to reach this level and complete this area to a pro. level. 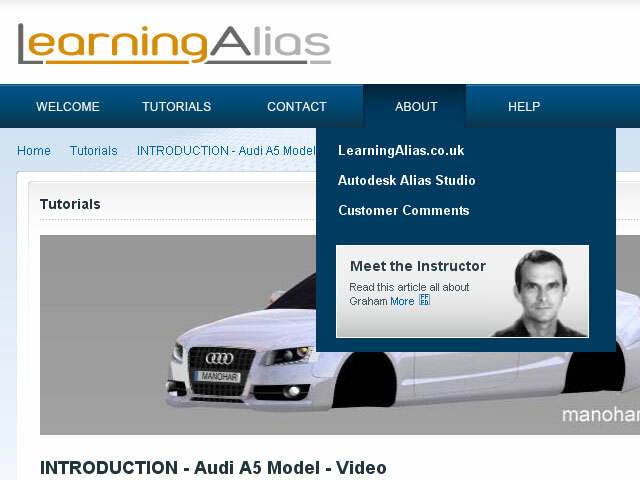 Alias Automotive Modelling is a very interesting and well paid profession and in my humble opinion, it is definitely worth investing in a short course now, so that you can go on to reap the benefits throughout a long and interesting career in the future. “Dear Sir, I have recently graduated in Transport Design and I am very happy with the course that I chose to follow, with one exception. The Alias teacher on my course was a great guy, but whereas he was brilliant at 3D Max, he didn’t seem to have been trained in Alias and as a result we didn’t learn much more than the basics. I am an average designer, so my chosen career path is Automotive Alias Modelling or if I’m lucky Des/Modelling. Various major OEM’s have head-hunted the 3 or 4 outstanding students from my year, all of whom have parents who paid for expensive Alias courses for them. The remainder of us had to rely on the limited amount of Alias taught within our course and in adition to this, we had very few Alias hours per week on a workstation. Like most of my student group, I know very little about Nurbs from Mesh and I am very slow at it, so those Interviews were Absolute Hell! Can you please tell me how I can get a job, when the level of Alias I have been taught is way below Industry Entry level requirement. Before I answer your question, I feel it only fair to commend the college lectures worldwide who work very hard for their salary and do a great job. The reason that there are so few lectures who have Industrial competence in Alias Automotive, is a matter of simple economics. An Alias modeller earns 50€ per hour/60USD. whereas a highly skilled college lecturer earns just 15-18€/18-20 USD, so it is unreasonable to expect a lecturer, who must have knowledge and skills across a wide range of platforms, to have Industrial level Alias skills. If you want to become an Alias specialist, you must do the hard miles in your own time. To all college lecturers out there. RESPECT! First of all there is no need to panic about your lack of Alias skills! Whilst it is true to say that with your current skill level nobody is likely to offer you a job in this economic climate. However to raise yhour Alias skill level, is an achievable task. I deal with a lot of Post Grads. who are in your position. Some are talented Designers and other want to become Alias Modellers. I offer a very comprehensive Alias Automotive course, which includes a high level of Reverse Engineering (you get to surface and entire exterior using Nurbs from Mesh ). As regards modelling to Class A Principals , on the this course you get to build 2 more exteriors, one of which is the Audi A5 Sportback 2009/ 2012 face-lift. All students who have completed my course find Alias jobs, without exception. Interviews panels are always impressed by students who have 3 complete exteriors modelled with Bezier surfaces to show and who can surface a mesh quickly and acurately. It is quite normal nowadays for an interviewee to be thrown a mesh of say the front corner of a car or a complete but relatively simple exterior and given 5 to eight hours to surface it. All graduates from LearningAlias are equipped with these skills and feel comfortable performing, such interview tasks. I have trained Trans/Des. post grads. who were working in Gfx. studios or worse still, in shops and trained them to entry level, reulting in successfull employment in the Automotive Industry. As many students cannot afford even 167€ /200USD. per month , I allow them to pay 100€ / 120 USD. and then pay the outstanding balance once they have an Alias job. Timing: Post Grads. need between 3-9 months to complete the LearningAlias course and have all the skills that Industry is demanding. The answer is quite simply that you cannot define an x-sec, which is not given by the blueprints. But don’t worry if you are my student I will provide the x-sec from my own model. Simple. Go and get the designer and get him/her to draw the required x-sec. A good efficient designer will usually find time amongst his myriad of work commitments to visit the Alias modeller once or twice a day and during these sessions he will help you to define areas of the model that are vague and at the same time develop his or her design by requesting changes to improve the model. This close team work, between a skilled Alias Digital Sculptor and a very good Designer, is the most efficient way to develop the design into a 3D model, which can eventually be milled at any scale into a physical model. The physical model can be further developed and then presented to senior management. At this point there may be say 3 teams competing against each other, so this means 3 models made in say Munich, Torino and CA. being presented in a presentation show room with turn tables, at the same time. It’s quite common that the Chief Designer will take features which he likes from one model and instruct another designer to incorporate them in his model. Does a Designer need to be a competent Alias Modeller? I would say yes! In today’s tight economic environment, models have to be developed more quickly than was the case a decade ago and if the designer understands Alias surfacing then he can understand the problems faced by the modeller and give intelligent advice on how an area of the vehicle could be re-modelled in the shortest possible time. David Torres is now working in the way I have described above. He has a very close relationship with his designer and is asked several times a week to make changes to his model. If you can work like this in a tight team with your designer, the project will evolve quickly, which the company will appreciate, as time is a LOT of money. Your way of working and the support /service you give the designer will definitely NOT go un-noticed, your work ethic will be commended and you will be given the best projects to work on, as well as being on the short list of most wanted modellers that the modelling Manager will refer to when hiring for future projects. In short you will always have work and the work you are given will be cutting edge!